DC may have a long way to go before it enters into any national BBQ conversations (one of the Best Barbecue Cities in America, it ain’t). But that doesn’t mean there's not smoked meat in this town that should be pillaged with the enthusiasm of cage fighters after a weigh-in. 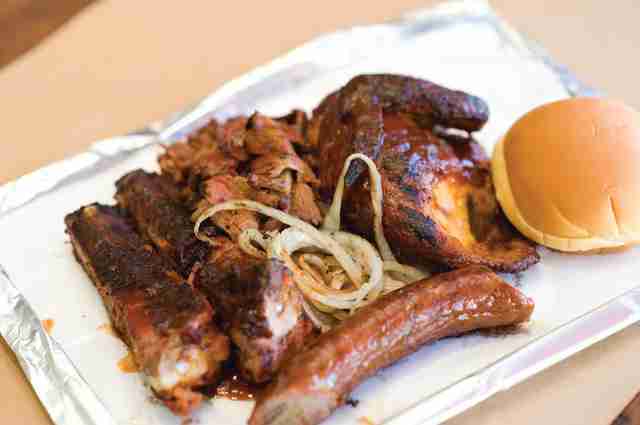 Here are the 10 best places in the area to put away some solid ‘cue. 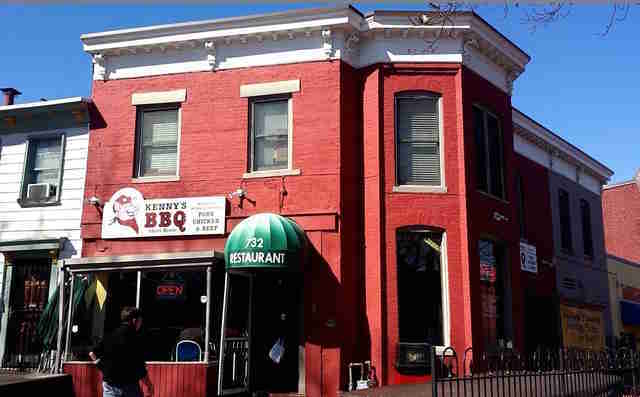 AdMo’s favorite barbecue spot eschews the ordinary. Its chef, Logan McGear, is more mad scientist than pitmaster, spinning out crazy plates like smoked tri-tip with mumbo compound butter; sirloin and chipotle Gouda mac n’ cheese wontons; smoked duck quarters; and hog wings made out of pork shanks. What he doesn’t make in-house, he brings in with reason -- like spicy sausages from Smith’s Red & White, a butcher shop in North Carolina, paired with Cheerwine. As an added bonus, McGear welcomes vegans in to barbecue culture by offering vegan spare ribs, vegan wings, and vegan shrimp fried in Victory Brewing Prima Pils tempura batter. DCity Smokehouse is experiencing growing pains. It's currently serving addictive grub out of Wicked Bloom DC while playing the waiting game for its forthcoming location, slated to open in late spring. Eventually, it'll be open at 203 2nd St NW. Shawn McWhirter stepped in as the new pitmaster in January, but the brisket champ is no less extraordinary than before. 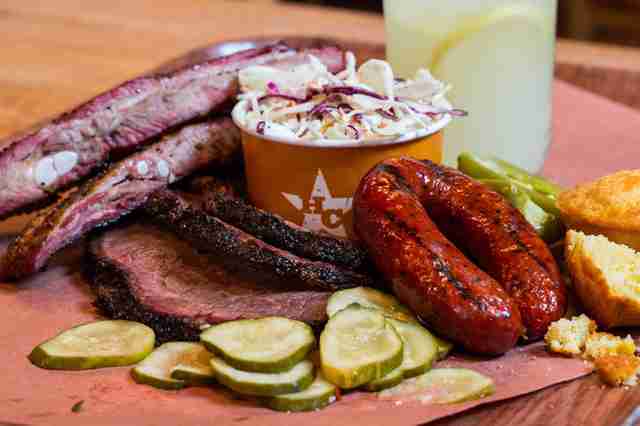 Sure, DCity Smokehouse offers platters of brisket, turkey, chopped pork, and beyond. But where it slays is between the bread -- so order a sandwich. The BBQ Joint benefits from a baller pit-master, Andrew Evans. 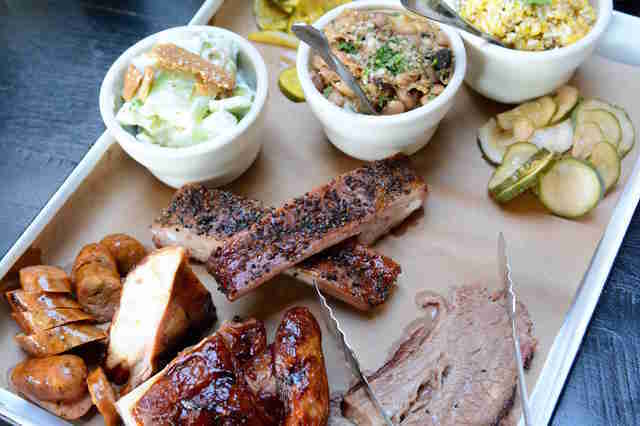 After experiencing a light bulb moment judging a BBQ competition, Evans, who once crushed it at fine dining, ditched the white tablecloth scene in favor of flavorful ‘cue. His local chainlet -- The BBQ Joint -- got its smoky start in small-town Maryland. 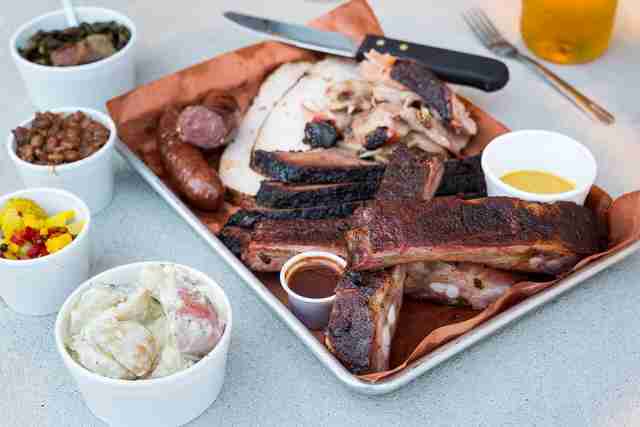 Now you can try his pulled pork, brisket, ribs, sausages, and smoked turkey in Union Market and on 14th Street NW. Andrew dubs his style “Texas meets Kansas City,” and we can’t get enough of his “swicy” sauce. 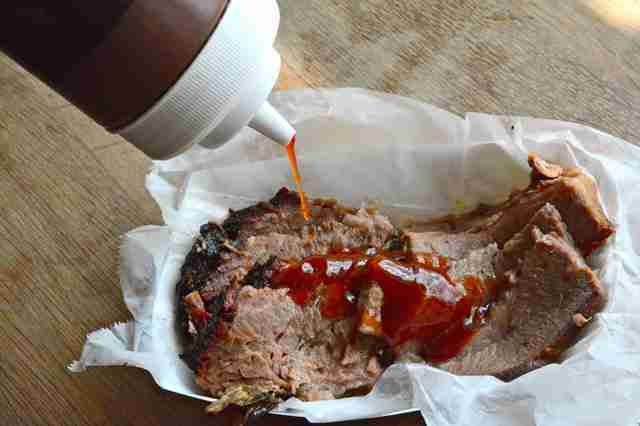 Hill Country might be a New York import, but it’s all about Texas: the two biggest ingredients are dry rub and patience. Meats benefitting from Hill Country’s low, slow method of cooking include gargantuan bone-in short ribs, beef shoulder clod (for those who dig lean meat), brisket, pork loin, and pork spare ribs. If you’re feeling like sausage, note that it brings in two flavors from Kreuz Market in Lockhart, TX. In addition to sides like Longhorn cheddar mac & cheese, you also need to save a little love for their Rock n’ Twang live band karaoke on Wednesdays at 8:30pm. A practically medicinal combination of barbecue, German beer, and fresh air, an afternoon at Garden District can cure a day spent behind a desk answering to the man -- especially if the field hockey stick of a beef rib is on special. 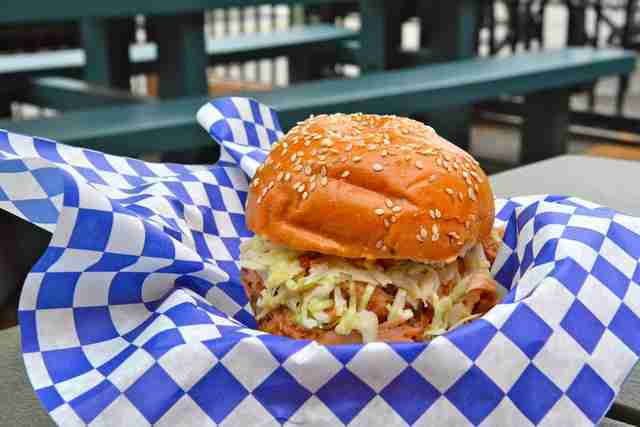 Otherwise, double down on super-tender pulled pork sandwiches paired with any offering from Weihenstephaner brewery, and remember to order a bucket of house-made pickles. Because absence makes the heart grow fonder, the barbecue will taste even better now that Garden District reopened after a dormant winter. Don’t act like you haven’t trudged past the property in the snow, eyeing it with the same longing look teenage girls reserve for One Direction. 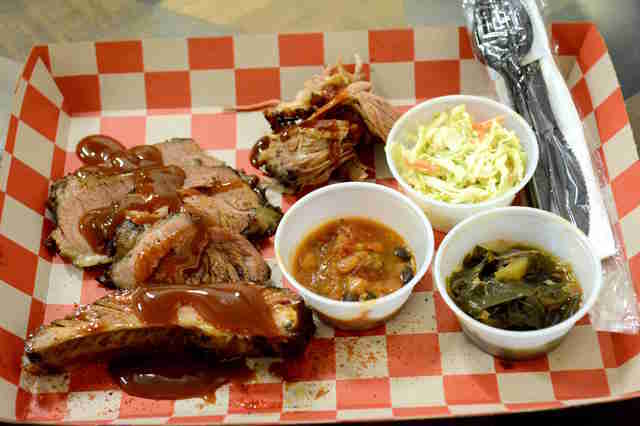 Make your own meat-tasting menu at Fat Pete’s. Start with an appetizer of burnt ends, then move on to the Fat Pete Combo Platter, where you can select among chopped pork, St. Louis-style ribs, sliced brisket, pulled chicken... the list goes on. Then, play graffiti artist as you spray each pile with a different sauce, including "Alabama white" or "Texas mop sop." Sides will help fend off the meat sweats -- especially the cornbread with apple honey butter, or mashed potatoes that will make you think of mom. 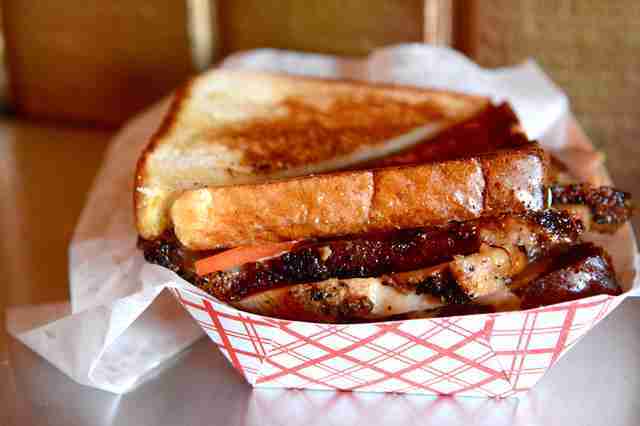 We’d tell you about the Belly Buster sandwich, but we don’t want to be responsible for what happens if you eat it. 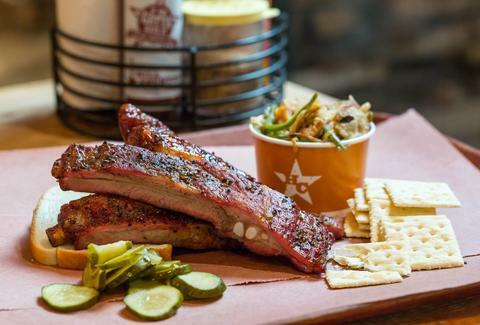 If there's a destination BBQ joint in the DC area, it’s Smokehouse Live in Leesburg, VA. Those making the drive will first notice the newcomer’s sheer size; the space is 16,000 sq ft, seats 600, and requires two smokers, which are capable of smoking 2,500lbs of meat. If you’re not overly concerned with your figure, visit for the $19.95 all-you-can-eat country brunch buffet on Sundays (10am-2pm), backed by music from local artists. The rest of the week, bring your better half and take on the “big meaty” platter, which comes with Savannah chicken, spare ribs, brisket, pulled pork, sausage, and sides. Note that the pickles are aged in Catoctin Creek whiskey barrels, and the cornbread comes with roasted peach butter. Both are musts. Sure, the brisket and the black pepper-lacquered ribs will do the trick at Texas Jack’s. But they run on the expensive side, making sides the real reason to visit the Arlington newcomer. We hit rock-bottom on our Styrofoam container of esquites (pan-fried corn with Cotija cheese); smashed cucumbers with Greek yogurt and jalapeño honey; and “porky pinto bean risotto.” Another big plus is the drink menu: in addition to a deep bench of bourbon and whiskey, it also pours 12 local drafts, and stirs cool cocktails like the smoked whiskey sour. When Rocklands founder John Snedden wasn’t in the classroom at Washington and Lee University in the late ‘70s, he was earning friends barbecuing whole hogs for fraternities and local farms. It was the start of something beautiful, and the DC area has been the beneficiary. The first location in Glover Park opened in 1990 -- and never looked back. Try oak- and hickory-smoked meat by the pound, in a sandwich, or on a platter. Veterans, however, order The Pearl -- a pile of mac & cheese, barbecue baked beans, chopped pork, and barbecue sauce stacked like a layered dip. For no-frills barbecue still riding the wave of a 2012 Obama visit, there’s Kenny’s. To make the most of a meal, grab an outdoor table and order a slab of hickory-smoked pork, beef, or baby back ribs, with some simple sides like sweet potatoes, collard greens, or baked beans, and chow down. There’s also the added bonus of some Korean flair. It offers bulgogi in addition to all the traditional ‘cue options. Platters run on the more affordable side -- beef ribs and chicken with two sides and cornbread go for $16.95. Laura Hayes is a DC-based food, drink, and travel writer who also contributes to Washington City Paper, Food Network, Arlington Magazine, and others. She proudly hit Garden District on opening day and prefers when her clothes smell like BBQ smoke. Follow her on Twitter @BTMenu.